The most common symptom of peripheral artery disease is called "claudication," which is pain or cramping in the thighs or calves when walking, though some people may have no symptoms at all. Diagnosing peripheral artery disease is simple and painless since pulses in the legs and feet can be felt upon physical exam. However, the ankle-brachial index (ABI), which compares the blood pressure in the ankle with the blood pressure in the arm, serves as the most common diagnostic tool since it is more accurate than a standard pulse exam. This can also be combined with a non-invasive arterial duplex ultrasound, which allows us to look inside the arteries in an effort to track the flow of blood towards the feet, as well as identify any plaque buildup or blockages. For severe peripheral artery disease, an angiogram can allow a doctor to see the exact location of a blockage and if indicated, has the advantage of allowing treatment to be rendered at the same time. Many cases of peripheral artery disease can be treated with medications and risk factor modification. These include smoking cessation, supervised exercise programs and weight loss, antiplatelet medication (aspirin, Plavix), statins to lower cholesterol, blood pressure control, glucose control for diabetics, and optimization of any other cardiac or vascular conditions which might exist. To alleviate symptoms, improve wound healing, or prevent the possibility of amputation, severe cases may require revascularization or restoration of blood flow to the legs and feet. This can be accomplished through either open surgical bypass or endovascular repair. A surgical bypass allows a blood vessel made of the patient’s own vein (or a synthetic fabric) to allow blood flow around the blocked or narrowed artery, while endovascular repair will require the arterial insertion of a mesh framework (angioplasty or stent) to keep the artery open. In addition, there are several new advanced endovascular technologies such as an atherectomy, which can be used to remove the plaque from within the artery through a simple skin puncture that does not require an incision. Again, treatment should be individualized for each patient. 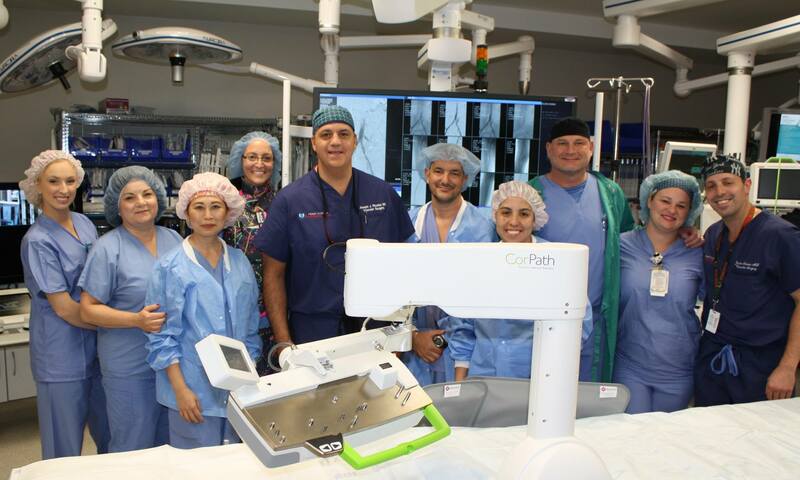 At Tenet Florida Cardiovascular Care, we prefer to utilize an “endovascular-first” approach for our patients and have had great success eliminating symptoms, healing wounds, and saving limbs and lives using our state-of-the-art endovascular tools and innovative techniques. My husband had the VenaSeal procedure performed by Dr. Ricotta at his office to treat the veins in his legs on Valentine's Day. The best Valentine imaginable! After the procedures Dr. Ricotta performed neither of us needed elastic stockings or our legs wrapped. We are back to a normal, pain free life.